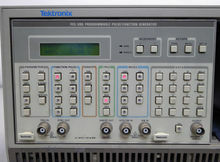 The Tektronix PFG5105 is a 12 MHz pulse/function generator plug-in for the TM5000 system. The PFG5105 seems to be very similar to the AFG5101 by swapping the arbitrary waveform generator with a pulse generator. This page was last edited on 8 April 2019, at 18:01.